Biopic. Drama. Comedy. Gay Interest. 1940s. 1950s. 1960s. 1970s. 01 Nigel's Choice. True Stories. Made for TV. Recommended. 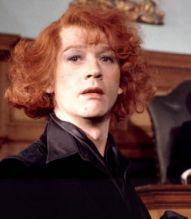 A brilliant biopic of Quentin Crisp the self-styled "Stately Queen of England", an effeminate gay, a flamboyant exhibitionist, sparkling wit and a character who gave more pleasure to the world than the world gave to him. Played brilliantly and with pathos by the versatile Hurt.